A lot has been written about the complex dynamics of female friendships, but the world of male friendships is sometimes less-explored in late-elementary school fiction books. 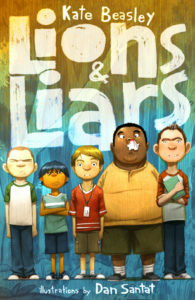 Lions & Liars features Frederick Frederickson, who, despite being a self-proclaimed flea, shows a considerable amount of insight about himself, his masculinity, and his interactions with his so-called friends. Beasley writes a fast-paced plot with young male characters who deal with society’s assumptions about their supposed “badness.” Young readers will come for the exciting story, but will leave having a more nuanced view of their role in their friendships and society. Looks like a good read! Thanks for the review! The other night I was walking around my neighborhood listening to this on earphones, and I laughed out loud several times, which was awkward but worth it. After I laughed one of the times I looked over to see a man standing in his driveway smoking a cigarette in the darkness, glaring at me, with a pit bull sitting at his side. This was creepy but somehow made it even more funny. As nice as it is to have Santat’s illustrations the audiobook is also worth seeking out because the narrator has pretty great comedic delivery.